Oluwaseyi is an experienced midwife and educator. She obtained a Masters in Research from the City University, London. 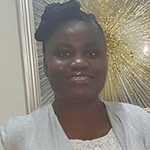 Oluwaseyi is in a joint appointment as a Lecturer Practitioner in Midwifery with at LSBU and Barking, Havering and Redbridge University Hospital Trust (BHRUT). Oluwaseyi commenced teaching undergraduate student in midwifery programmes in 2018. She engages in clinical teaching sessions to enhance students’ confidence whilst in practice. As a Lecturer Practitioner in Midwifery, she facilitates students both in theoretical and practical aspects of midwifery that enhances their learning and progression towards their qualification as a midwife. Oluwaseyi conducted qualitative research to explore pregnant women and midwives perceptions of using mobile applications (apps) or internet, in comparison to a traditional face to face appointments for the primary antenatal information gathering consultation (the booking appointment). Oluwaseyi is a registered nurse and midwife with the Nursing and Midwifery Council. She is a member of the Royal College of Midwives.